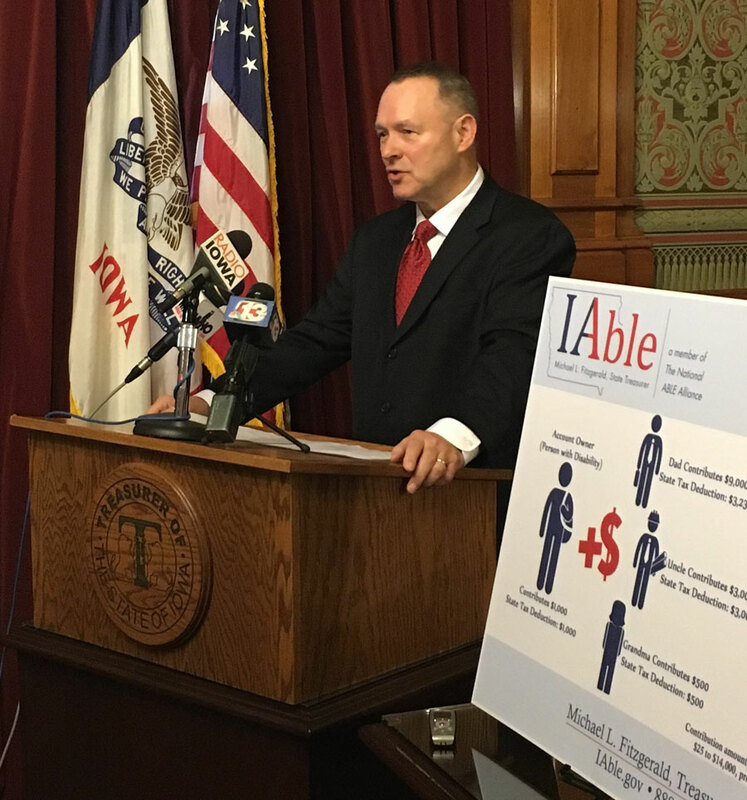 This week, state officials have launched IAble — a new savings plan for Iowans who want to save for the care of a mentally or physically disabled family member. State Treasurer Michael Fitzgerald says Iowa is partnering with 14 states to offer this program. Fitzgerald says IAble gives Iowans concerned about the well-being of a loved one the opportunity save for future disability-related expenses. However, there is an upper limit to each account of $100,000 in total contributions. Savers will get a tax break, similar to the “College Savings Iowa” accounts Fitzgerald’s office also manages. In addition, these IAble savings accounts won’t make the Iowan ineligible for Social Security Disability benefits or Medicaid. “That’s a real important feature for families and people with disabilities,” Fitzgerald says. Under current rules, a disabled American loses their Social Security Disability and Medicaid benefits if they have more than $2000 in savings. Fitzgerald officially unveiled the IAble program this week, but the website went live last week and five people found it and signed up. IAble was developed based on tax breaks outlined in the federal “Achieving a Better Life Experience” or ABLE Act.